158k!Help us bring Ross home. Sign the petition! Ross Ulbricht is a first-time offender serving two life sentences without parole + 40 years for all non-violent charges associated with creating the Silk Road website. Passionate about free markets and privacy, he was 26 when he made the site. He was never prosecuted for causing harm or bodily injury and no victim was named at trial. Silk Road was an online marketplace with an emphasis on user privacy. Using the cryptocurrency Bitcoin on the Tor browser, consenting people chose to anonymously exchange a variety of goods, both legal and illegal, including drugs (most commonly small amounts of cannabis). Prohibited was anything involuntary that created victims or used force. Ross was not accused of selling drugs or illegal items himself, nor did he launder money or hack computers, but was held responsible for what others sold on the site. Ross is now serving his sixth year in prison and has paid a heavy price. He was an idealistic entrepreneur who never intended harm. He has taken responsibility for his mistake and expressed profound remorse for it. Now wiser and more mature, he has learned his lesson the hard way, and if released tomorrow, he would never break the law again. Ross clings to the hope of a second chance and dreams of a future where he can use his education, knowledge and skills to contribute to society, and inspire change as an advocate for criminal justice reform. Ross’s sentence shocks the conscience. It is wildly excessive and disproportionate to those imposed on others for similar, or worse, conduct. There is a grotesque disparity between Ross’s life sentence—which is unheard of for a young man with no criminal history and all non-violent charges—and the sentences of other defendants related to the case. Ross’s 40-year sentence alone exceeds that of all the other Silk Road defendants combined, who all received sentences ranging from 17 months to 10 years. The judge used uncharged allegations that were never ruled on by a jury, to justify her sentence, in violation of the Sixth Amendment right to a jury trial. She also violated the First Amendment by basing her sentence, in part, on what she perceived was Ross’s political philosophy. The New York prosecution alleged that Ross planned murders-for-hire, but never charged him for it. All Ross’s charges at trial were non-violent. An indictment in Maryland included the allegations, yet it was never prosecuted and was dismissed with prejudice almost five years later. 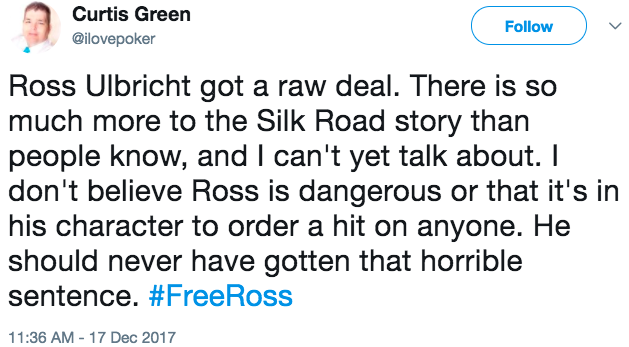 Ross always denied the allegations, those who know him never believed them, and even alleged target Curtis Green has publicly stated he doesn’t think Ross ordered a hit on anyone and is a fervent supporter. This smear was used to deprive Ross of bail, bias the jurors, and justify a barbaric sentence. That this was never ruled on by a jury or proven in court, yet used to condemn Ross to a life sentence, was a major question in Ross’s petition to the Supreme Court. On June 28, 2018, the Supreme Court declined to address Ross’s appeal. This denial failed to uphold internet privacy and fair trials, and also ended Ross’s options for direct appeal. But we can’t give up. We cannot let him live out the rest of his life in a cage. We are now seeking clemency from the President. To that end, we have launched a clemency petition. Within the first month, we surpassed 60,000 signatures and now have nearly 160,000. We need yours, too! Please take a minute to sign and share the petition far and wide! This has been a long, hard fight but we remain hopeful and optimistic. We are not a wealthy family though and we cannot do this alone. We are just regular people fighting every day to get Ross some relief. We will not give up but we have a steep mountain to climb. Please join us, not just for Ross, but against injustice and for your rights. Since his arrest, Ross has been steadfastly supported by his family and friends, as well as by many across the political spectrum. There is a growing, global consensus that Ross’s case is a miscarriage of justice that needs to be remedied. Close to 100 eminent organizations and individuals have voiced their support, including the criminal justice reform, technology, blockchain and liberty communities.